Recrystallized limestone producing interlocking grains of calcite. 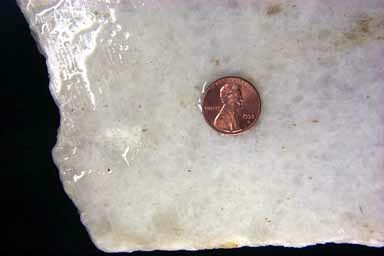 This is a saw cut specimen, wet with water to bring out the grains. Marble is an extremely variable rock in appearance since it depends on what limestone was the parent, and the degree of metamorphism it underwent. It can be virtually any color from white to black to red to green, etc., and sometimes it will contain metamorphosed fossils or other components. The most definitive test for the rock would be acid (vigorous bubbling), and a hardness less than glass. None specific. Limestone will convert into marble with virtually any type of metamorphism. The main exception is hydrothermal metamorphism which introduces silica rich fluids, in which case the rock turns into calcium rich silicate skarn minerals.